Measurement is the assignment of a number to a characteristic of an object or event, which can be compared with other objects or events. The scope and application of measurement are dependent on the context and discipline. In the natural sciences and engineering, measurements do not apply to nominal properties of objects or events, which is consistent with the guidelines of the International vocabulary of metrology published by the International Bureau of Weights and Measures. However, in other fields such as statistics as well as the social and behavioral sciences, measurements can have multiple levels, which would include nominal, ordinal, interval and ratio scales. Measurement is a cornerstone of trade, science, technology, and quantitative research in many disciplines. Historically, many measurement systems existed for the varied fields of human existence to facilitate comparisons in these fields. Often these were achieved by local agreements between trading partners or collaborators. Since the 18th century, developments progressed towards unifying, widely accepted standards that resulted in the modern International System of Units (SI). This system reduces all physical measurements to a mathematical combination of seven base units. The science of measurement is pursued in the field of metrology. The measurement of a property may be categorized by the following criteria: type, magnitude, unit, and uncertainty. They enable unambiguous comparisons between measurements. The level of measurement is a taxonomy for the methodological character of a comparison. For example, two states of a property may be compared by ratio, difference, or ordinal preference. The type is commonly not explicitly expressed, but implicit in the definition of a measurement procedure. The magnitude is the numerical value of the characterization, usually obtained with a suitably chosen measuring instrument. A unit assigns a mathematical weighting factor to the magnitude that is derived as a ratio to the property of an artifact used as standard or a natural physical quantity. An uncertainty represents the random and systemic errors of the measurement procedure; it indicates a confidence level in the measurement. Errors are evaluated by methodically repeating measurements and considering the accuracy and precision of the measuring instrument. Measurements most commonly use the International System of Units (SI) as a comparison framework. 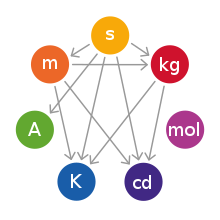 The system defines seven fundamental units: kilogram, metre, candela, second, ampere, kelvin, and mole. Six of these units are defined without reference to a particular physical object which serves as a standard (artifact-free), while the kilogram is still embodied in an artifact which rests at the headquarters of the International Bureau of Weights and Measures in Sèvres near Paris. Artifact-free definitions fix measurements at an exact value related to a physical constant or other invariable phenomena in nature, in contrast to standard artifacts which are subject to deterioration or destruction. Instead, the measurement unit can only ever change through increased accuracy in determining the value of the constant it is tied to. The seven base units in the SI system. Arrows point from units to those that depend on them. The first proposal to tie an SI base unit to an experimental standard independent of fiat was by Charles Sanders Peirce (1839–1914), who proposed to define the metre in terms of the wavelength of a spectral line. This directly influenced the Michelson–Morley experiment; Michelson and Morley cite Peirce, and improve on his method. With the exception of a few fundamental quantum constants, units of measurement are derived from historical agreements. Nothing inherent in nature dictates that an inch has to be a certain length, nor that a mile is a better measure of distance than a kilometre. Over the course of human history, however, first for convenience and then for necessity, standards of measurement evolved so that communities would have certain common benchmarks. Laws regulating measurement were originally developed to prevent fraud in commerce. Units of measurement are generally defined on a scientific basis, overseen by governmental or independent agencies, and established in international treaties, pre-eminent of which is the General Conference on Weights and Measures (CGPM), established in 1875 by the Metre Convention, overseeing the International System of Units (SI) and having custody of the International Prototype Kilogram. The metre, for example, was redefined in 1983 by the CGPM in terms of light speed, while in 1960 the international yard was defined by the governments of the United States, United Kingdom, Australia and South Africa as being exactly 0.9144 metres. In the United States, the National Institute of Standards and Technology (NIST), a division of the United States Department of Commerce, regulates commercial measurements. In the United Kingdom, the role is performed by the National Physical Laboratory (NPL), in Australia by the National Measurement Institute, in South Africa by the Council for Scientific and Industrial Research and in India the National Physical Laboratory of India. Before SI units were widely adopted around the world, the British systems of English units and later imperial units were used in Britain, the Commonwealth and the United States. The system came to be known as U.S. customary units in the United States and is still in use there and in a few Caribbean countries. These various systems of measurement have at times been called foot-pound-second systems after the Imperial units for length, weight and time even though the tons, hundredweights, gallons, and nautical miles, for example, are different for the U.S. units. Many Imperial units remain in use in Britain, which has officially switched to the SI system—with a few exceptions such as road signs, which are still in miles. Draught beer and cider must be sold by the imperial pint, and milk in returnable bottles can be sold by the imperial pint. Many people measure their height in feet and inches and their weight in stone and pounds, to give just a few examples. Imperial units are used in many other places, for example, in many Commonwealth countries that are considered metricated, land area is measured in acres and floor space in square feet, particularly for commercial transactions (rather than government statistics). Similarly, gasoline is sold by the gallon in many countries that are considered metricated. The metric system is a decimal system of measurement based on its units for length, the metre and for mass, the kilogram. It exists in several variations, with different choices of base units, though these do not affect its day-to-day use. Since the 1960s, the International System of Units (SI) is the internationally recognised metric system. Metric units of mass, length, and electricity are widely used around the world for both everyday and scientific purposes. The metric system features a single base unit for many physical quantities. Other quantities are derived from the standard SI units. Multiples and fractions are expressed as powers of 10 of each unit. When smaller or larger units are more convenient for given use, metric prefixes can be added to the base unit to denote its multiple by a power of ten: a thousandth (10−3) of a metre is a millimetre, while a thousand (103) metres is a kilometre. Unit conversions are thus always simple, so that convenient magnitudes for measurements are achieved by simply moving the decimal place: 1.234 metres is 1234 millimetres or 0.001234 kilometres. The use of fractions, such as 2/5 of a metre, is not prohibited, but uncommon. There is no profusion of different units with different conversion factors as in the Imperial system which uses, for example, inches, feet, yards, fathoms, and rods for length. The mole was subsequently added to this list and the degree Kelvin renamed the kelvin. There are two types of SI units, base units and derived units. Base units are the simple measurements for time, length, mass, temperature, amount of substance, electric current and light intensity. Derived units are constructed from the base units, for example, the watt, i.e. the unit for power, is defined from the base units as m2·kg·s−3. Other physical properties may be measured in compound units, such as material density, measured in kg/m3. The SI allows easy multiplication when switching among units having the same base but different prefixes. To convert from metres to centimetres it is only necessary to multiply the number of metres by 100, since there are 100 centimetres in a metre. Inversely, to switch from centimetres to metres one multiplies the number of centimetres by 0.01 or divide centimetres by 100. A ruler or rule is a tool used in, for example, geometry, technical drawing, engineering, and carpentry, to measure lengths or distances or to draw straight lines. Strictly speaking, the ruler is the instrument used to rule straight lines and the calibrated instrument used for determining length is called a measure, however common usage calls both instruments rulers and the special name straightedge is used for an unmarked rule. The use of the word measure, in the sense of a measuring instrument, only survives in the phrase tape measure, an instrument that can be used to measure but cannot be used to draw straight lines. As can be seen in the photographs on this page, a two-metre carpenter's rule can be folded down to a length of only 20 centimetres, to easily fit in a pocket, and a five-metre-long tape measure easily retracts to fit within a small housing. Some non-systematic names are applied for some multiples of some units. The Australian building trades adopted the metric system in 1966 and the units used for measurement of length are metres (m) and millimetres (mm). Centimetres (cm) are avoided as they cause confusion when reading plans. For example, the length two and a half metres is usually recorded as 2500 mm or 2.5 m; it would be considered non-standard to record this length as 250 cm. American surveyors use a decimal-based system of measurement devised by Edmund Gunter in 1620. The base unit is Gunter's chain of 66 feet (20 m) which is subdivided into 4 rods, each of 16.5 ft or 100 links of 0.66 feet. A link is abbreviated "lk," and links "lks" in old deeds and land surveys done for the government. Time is an abstract measurement of elemental changes over a non spatial continuum. It is denoted by numbers and/or named periods such as hours, days, weeks, months and years. It is an apparently irreversible series of occurrences within this non spatial continuum. It is also used to denote an interval between two relative points on this continuum. Mass refers to the intrinsic property of all material objects to resist changes in their momentum. Weight, on the other hand, refers to the downward force produced when a mass is in a gravitational field. In free fall, (no net gravitational forces) objects lack weight but retain their mass. The Imperial units of mass include the ounce, pound, and ton. The metric units gram and kilogram are units of mass. One device for measuring weight or mass is called a weighing scale or, often, simply a scale. A spring scale measures force but not mass, a balance compares weight, both require a gravitational field to operate. Some of the most accurate instruments for measuring weight or mass are based on load cells with a digital read-out, but require a gravitational field to function and would not work in free fall. The measures used in economics are physical measures, nominal price value measures and real price measures. These measures differ from one another by the variables they measure and by the variables excluded from measurements. In the field of survey research, measures are taken from individual attitudes, values, and behavior using questionnaires as a measurement instrument. As all other measurements, measurement in survey research is also vulnerable to measurement error, i.e. the departure from the true value of the measurement and the value provided using the measurement instrument. In substantive survey research, measurement error can lead to biased conclusions and wrongly estimated effects. In order to get accurate results, when measurement errors appear, the results need to be corrected for measurement errors. This computation used for the acceleration of gravity 9.8 metres per second squared (32 ft/s2). But this measurement is not exact, but only precise to two significant digits. The Earth's gravitational field varies slightly depending on height above sea level and other factors. The computation of 0.45 seconds involved extracting a square root, a mathematical operation that required rounding off to some number of significant digits, in this case two significant digits. Scientific experiments must be carried out with great care to eliminate as much error as possible, and to keep error estimates realistic. In the classical definition, which is standard throughout the physical sciences, measurement is the determination or estimation of ratios of quantities. 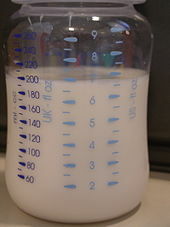 Quantity and measurement are mutually defined: quantitative attributes are those possible to measure, at least in principle. The classical concept of quantity can be traced back to John Wallis and Isaac Newton, and was foreshadowed in Euclid's Elements. In the representational theory, measurement is defined as "the correlation of numbers with entities that are not numbers". The most technically elaborated form of representational theory is also known as additive conjoint measurement. In this form of representational theory, numbers are assigned based on correspondences or similarities between the structure of number systems and the structure of qualitative systems. A property is quantitative if such structural similarities can be established. In weaker forms of representational theory, such as that implicit within the work of Stanley Smith Stevens, numbers need only be assigned according to a rule. Information theory recognises that all data are inexact and statistical in nature. Thus the definition of measurement is: "A set of observations that reduce uncertainty where the result is expressed as a quantity." This definition is implied in what scientists actually do when they measure something and report both the mean and statistics of the measurements. In practical terms, one begins with an initial guess as to the expected value of a quantity, and then, using various methods and instruments, reduces the uncertainty in the value. Note that in this view, unlike the positivist representational theory, all measurements are uncertain, so instead of assigning one value, a range of values is assigned to a measurement. This also implies that there is not a clear or neat distinction between estimation and measurement. In quantum mechanics, a measurement is an action that determines a particular property (position, momentum, energy, etc.) of a quantum system. Before a measurement is made, a quantum system is simultaneously described by all values in a spectrum, or range, of possible values, where the probability of measuring each value is determined by the wavefunction of the system. When a measurement is performed, the wavefunction of the quantum system "collapses" to a single, definite value. The unambiguous meaning of the measurement problem is an unresolved fundamental problem in quantum mechanics. ^ a b Pedhazur, Elazar J.; Schmelkin, Liora Pedhazur (1991). Measurement, Design, and Analysis: An Integrated Approach (1st ed.). Hillsdale, NJ: Lawrence Erlbaum Associates. pp. 15–29. ISBN 978-0-8058-1063-9. ^ a b International Vocabulary of Metrology – Basic and General Concepts and Associated Terms (VIM) (PDF) (3rd ed.). International Bureau of Weights and Measures. 2008. p. 16. ^ Kirch, Wilhelm, ed. (2008). "Level of measurement". Encyclopedia of Public Health. 2. Springer. p. 81. ISBN 978-0-321-02106-9. ^ "About Us". National Measurement Institute of Australia. ^ Groves, Robert (2004). Survey Methodology. New Jersey: Wiley. "By measurement error we mean a departure from the value of the measurement as applied to a sample unit and the value provided. " pp. 51–52 . ^ Gill, Simeon; Parker, Christopher J. (2017). "Scan posture definition and hip girth measurement: the impact on clothing design and body scanning". Ergonomics. 60 (8): 1123–1136. doi:10.1080/00140139.2016.1251621. PMID 27764997. ^ a b Michell, J. (1999). Measurement in psychology: a critical history of a methodological concept. New York: Cambridge University Press. ^ Stevens, S.S. On the theory of scales and measurement 1946. Science. 103, 677–80. ^ Penrose, Roger (2007). The road to reality : a complete guide to the laws of the universe. New York: Vintage Books. ISBN 978-0-679-77631-4. "The jumping of the quantum state to one of the eigenstates of Q is the process referred to as state-vector reduction or collapse of the wavefunction. It is one of quantum theory's most puzzling features ..." "[T]he way in which quantum mechanics is used in practice is to take the state indeed to jump in this curious way whenever a measurement is deemed to take place." p 528 Later Chapter 29 is entitled the Measurement paradox. Look up measurement in Wiktionary, the free dictionary.